An Ordinary Life : The does it dissolve experiment! The does it dissolve experiment! 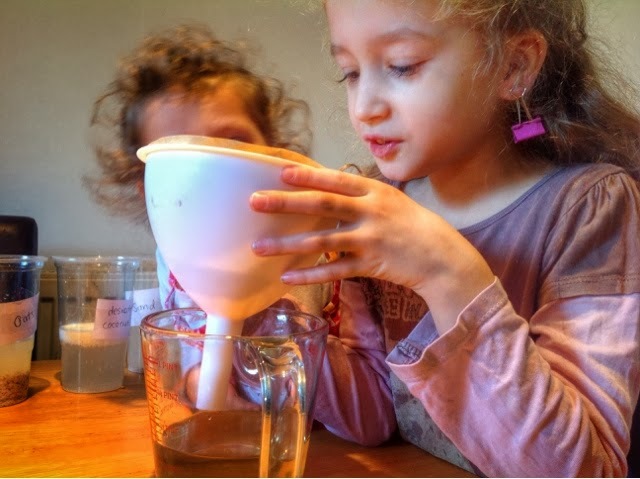 Yesterday my 3 year old said she wanted to do science! 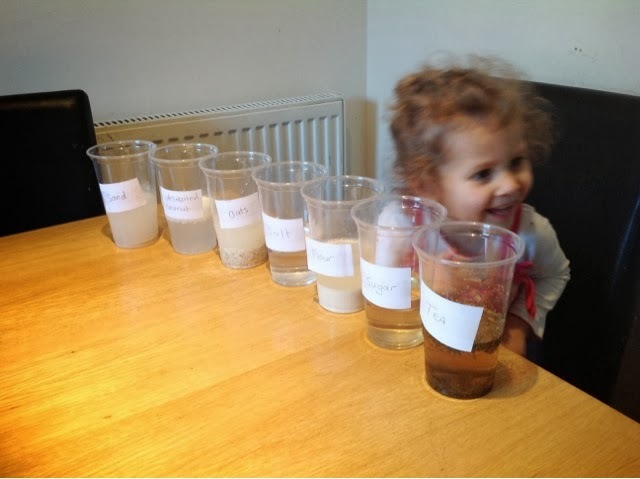 Mummy's science! So I thought for a moment and then an idea popped into my head and off I went searching for all the things she needed to do a Does it dissolve? Experiment! We prepared it yesterday but ran out of time to finish it so, this morning, we had lots of fun experimenting! Labels or paper and sticky tape. Pour a tablespoon of tea into one of the plastic cups. Label the cup tea. Then pour a tablespoon of sugar into the next cup and label that sugar. Repeat this for the Flour, Salt, oats, desiccated coconut and sand, ensuring that you label each one carefully. My 3 year old enjoyed helping me with this! 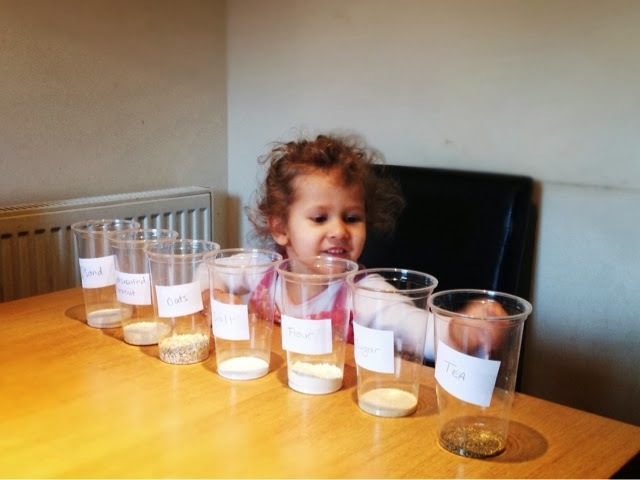 I allowed my 3 year old to look at each substance and touch them if she wanted just before I showed her a table I had drawn up. Here is a free PDF file containing a table for this investigation: Table to investigate dissolving. First, using the table I asked her to predict what would happen. At first Harmonie talked about dissolving as melting; she talked about things melting into the water. I didn't correct her as such, I did tell her yes, this melting into the water, in science it is called dissolving. She liked that very much although, for a three year old, saying dissolving is a challenge in itself! 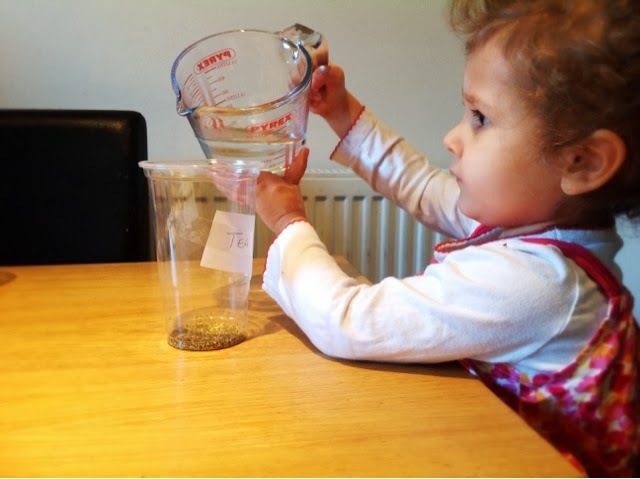 I simply put a tick if she thought it would dissolve and and x if she thought it wouldn't. We then looked carefully at each one and recorded on our table what really happened. I poured the first substance, the tea mixed with water, through a filter that sat in a funnel. Although part of the tea had dissolved there were still bits in it. I talked about how we can use filters to separate substances. A common method in chemistry. We did this for each of the substances. Harmonie and Honi thought it magical when they did the salt and sugar! I feel by gently touching on these subjects helps young mind think about and begin to understand the main points of science, all of this will help them in the future, especially if they have a big interest in science! 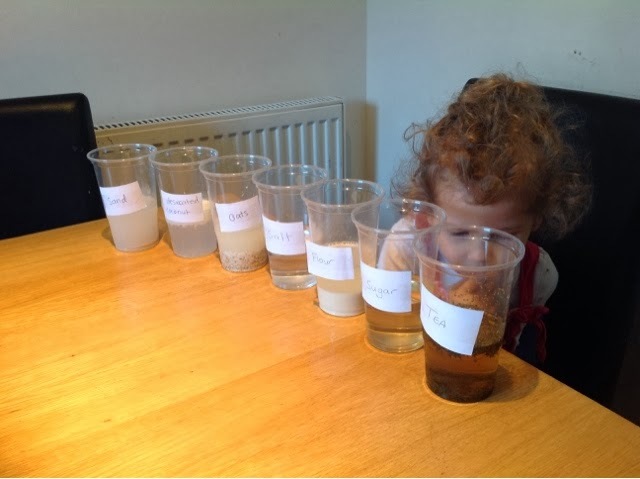 That is a brilliantly simple but comprehensive experiment - my son would say afterwards - "and what will happen if we add concentrated sulphuric acid to it?" - we did that with one experiment and produced clouds of iodine gas! !